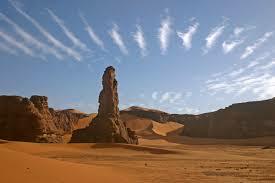 Tadrart Acacus located in western Libya on the borders of Tassili N’Ajjer about 1190 kilometres from Tripoli, Libya’s capital. This rocky massif has numerous cave paintings in very distinct styles dating from 12,000 B.C. to A.D. 100. They reflect the animal and plant changes and the different ways of life of the populations that succeeded one another in this region of the Sahara. Tripoli Zoo is located south of the city centre. There are animals like elephants, lions, tigers, reptiles, monkeys, gazelle and waddan. About 1230 kilometres from Tripoli is Cyrene which was founded as a Greek colony in the 7th century BC and became one of the wealthiest and most important cities in the Hellenic world. Cyrene’s highlights include the Temples of Zeus and Apollo, the Acropolis and the Agora, as well as baths, gymnasium and theatre. Apollonia, its port lies 18km away on the Mediterranean coast, with more Greek, Roman and Byzantine remains. Red Castle (Assaraya Alhamra) was a fortified castle built to defend the capital city. It is said to have been painted red after the Spanish invasions in 1510 AD. By the 1930s, it was re-named the Classical Museum and in 1988 renamed the Assaraya Alhmara Museum or Red Castle Museum. It is widely recognised as one of the most important and richest museums in the world. It contains information on prehistory, ancient Libyan Berber Tribes, Libyan-Punic-Greco-Roman-Byzantine Traditions and Natural History. Sabratha located in northwestern Libya 76 kilometres from Tripoli. It was a Phoenician trading post for gold, ivory, leather, spices and slaves brought to the Mediterranean from central Africa. Sabratha today has excellently preserved Roman ruins in a beautiful setting on the Mediterranean coast. Most famously, its theatre has a capacity of 5,000 and the stage area has been renovated with a three storey, marble-columned frons scena. Gurgi Mosque found in Tripoli as part of a complex of historic buildings was built in the 19th century. It has the most beautiful interior in the city though it is small. The main prayer hall contains imported marble pillars from Italy, ceramic tile work from Tunisia and intricate stone carvings from Morocco. The large, covered platform was reserved for Very Important People. To the right of the entrance is the antechamber that houses the tombs of Gurgi and his family. Leptis Magna was one of the most beautiful Roman cities founded by the Phoenicians in the 5th century BC. Buried under sand for centuries, the city has been extensively excavated since the 1920s. It is found 121 kilometres east of Tripoli. Among its many highlights are the Gladiator Circus, amphitheatre, marketplace, theatre, basilica and the many forums, baths, streets and arches. 23rd July Lake also known as Benghazi Lake is a lagoon of about 100 hectares between Benghazi’s downtown and the Mediterranean Port of Benghazi. It is about 1012 kilometres from Tripoli. Tobruk, located 1254 kilometres from Tripoli is the place of an important battle during the Second World War when Allied soldiers held out against a German siege in 1941. There are cemeteries for the Commonwealth, French and German soldiers. However little remains of Tobruk town itself. Ghadamès, once known as the ‘Pearl of the Desert’ is a historic town located in an oasis in the desert near the border with Tunisia and Algeria about 605 kilometres from Tripoli. It was an important stopping of point in the trans-Saharan trade routes between Timbuktu and the Mediterranean. It is renowned for its architecture and unique layout. The lower streets were reserved for men and the rooftops for women during daylight. Copyright © 2014 by FOA. Proudly powered by BDA.